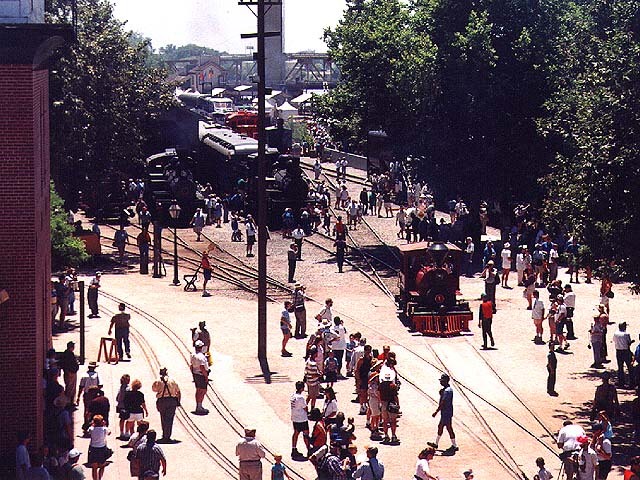 Billed as the last great railroad event of the 20th century, Railfair '99 rolled into Sacramento June 18-27 for a grand tribute to the history and pageantry of railroading. More than 40 pieces of rail equipment were on display on the grounds of the California State Railroad Museum and along the banks of the Sacramento River. An estimated crowd in excess of 200,000 people attended the event over its 10-day run. 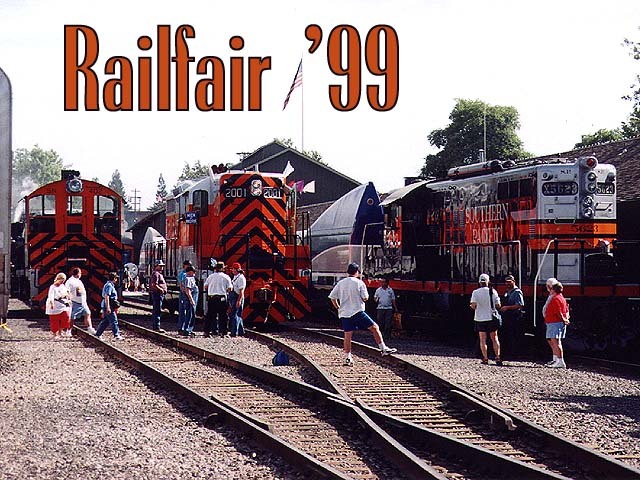 We visited Railfair '99 on June 21, a Monday. The temperature was typical of the Sacramento Valley in June  a blistering 98 degrees with little wind. The only thing hotter than the weather were the dozens of diesel and steam locomotives on display, all fired up and going through their paces for the Railfair crowd. Here is what we saw during our visit. 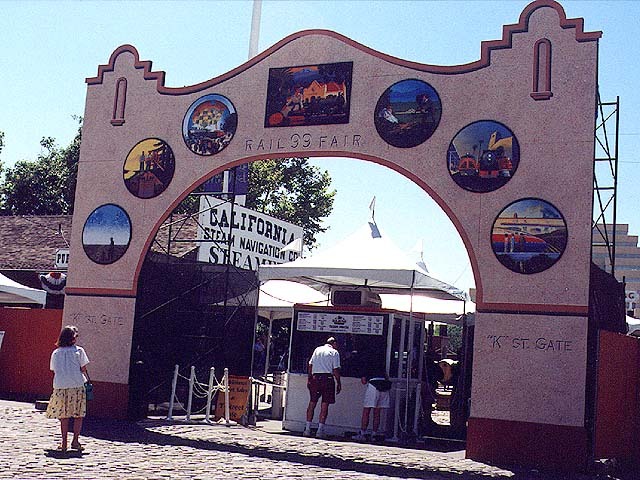 The facade at K Street marks one of three entrances to the Railfair grounds. The circular art lining the archway depicts the Railfair's various historical themes. We purchased our tickets in advance, as did many visitors, so the initial line to get in moved quickly. As one museum docent said while we all waited patiently to get into the main gate, "If you've come looking for the air show, you're in the wrong place." Photo by Roni Gehlke. Even for a weekday there is a good-sized crowd on hand, as evidenced by this aerial shot looking south from the balcony of the railroad museum. These tracks leading to the turntable were among the few places where static rail equipment displays were not constantly present, although many trains rolled over them during the course of the day. Photo by Roni Gehlke. 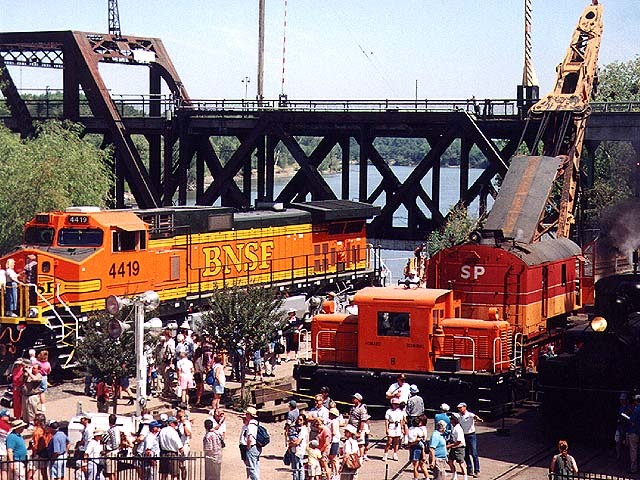 Another view from above the turntable, this time taken from the second floor of the Discovery Museum, shows the BNSF 4419 and the railroad museum's Southern Pacific steam crane. 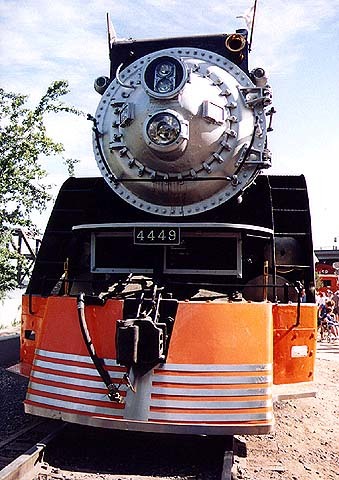 The 4419 was the most modern locomotive on display that was open to the public for tours. Barely two months from the factory, the GE 9-44CW had racked up less than 7,000 miles. It sure wasn't turning the old odometer sitting here. Photo by Roni Gehlke. 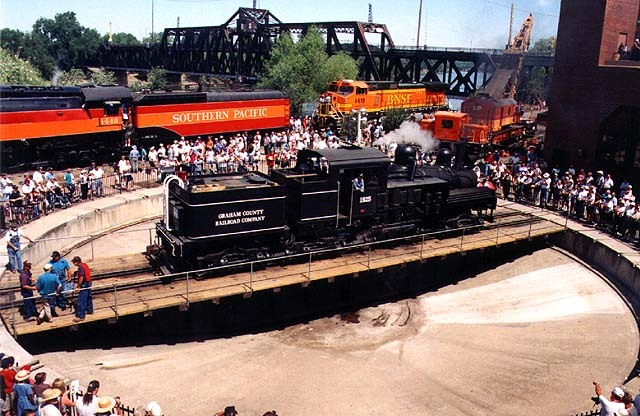 The Southern Pacific 4449 was among the star attractions at Railfair '99. 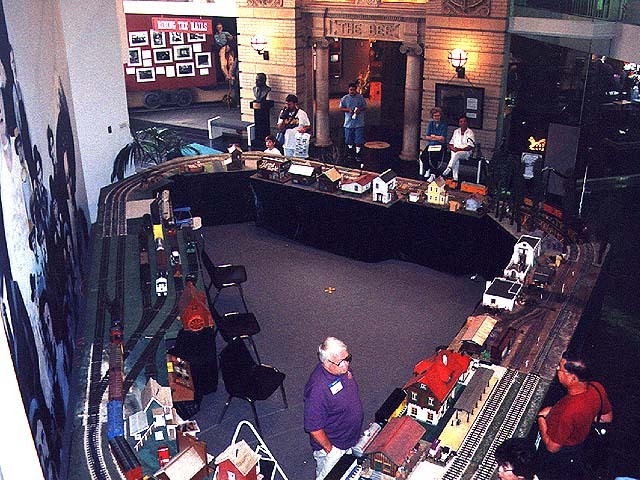 In this view from the Discovery Museum we see the locomotive in all its splendor, displayed uncomfortably on one of the museum's tracks. It was sandwiched between the BNSF 4419 and the UP 844. That's the I Street Bridge in the distance, where cars and trains alike cross the Sacramento River. Photo by Roni Gehlke. 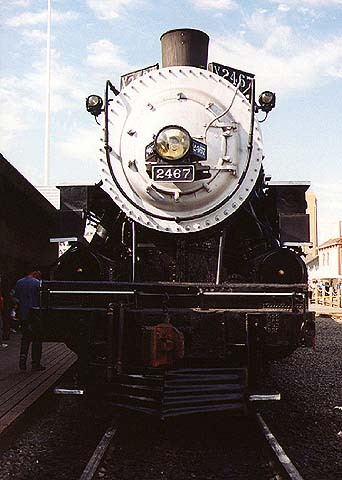 A view of the 4449 from the front shows the detail in this famous locomotive. Photo by Roni Gehlke. Yet more detail of the 4449 and its signature logo. Photo by Roni Gehlke. The museum's turntable was kept busy with a constant parade of steam equipment. 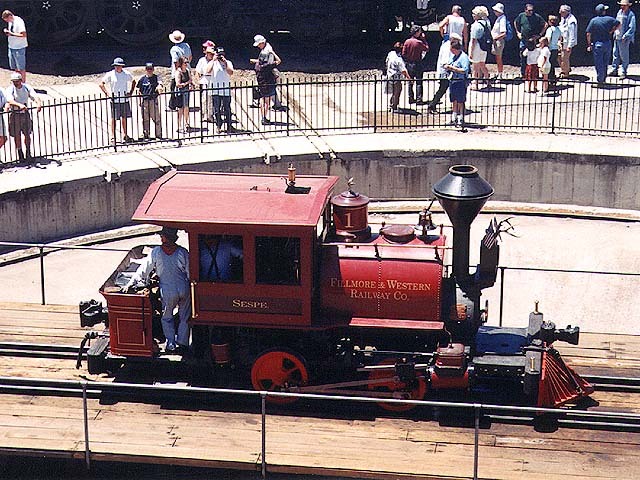 Here the Fillmore & Western's 0-4-0T "Sespe" struts its stuff for the crowd. Built in 1891, the little steamer makes its home in Fillmore, Calif. Photo by Roni Gehlke. A personal favorite of ours was the Graham County Railroad No. 1925, a Shay locomotive visiting from North Carolina. This coal-fired steamer has a whistle that commands attention, and the crew took great delight in sounding it loud and long during their spin around the turntable. Photo by Roni Gehlke. We will no doubt all rest a little easier knowing that No. 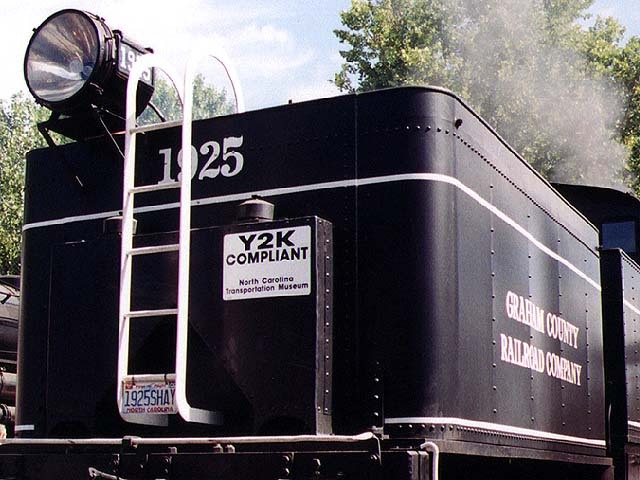 1925 is "Y2K compliant," as the sticker on the tender informs us. It was nice to see a little railfan humor. At least one other steamer bore a similar sign that read, "Y1.9K ready." Photo by Roni Gehlke. 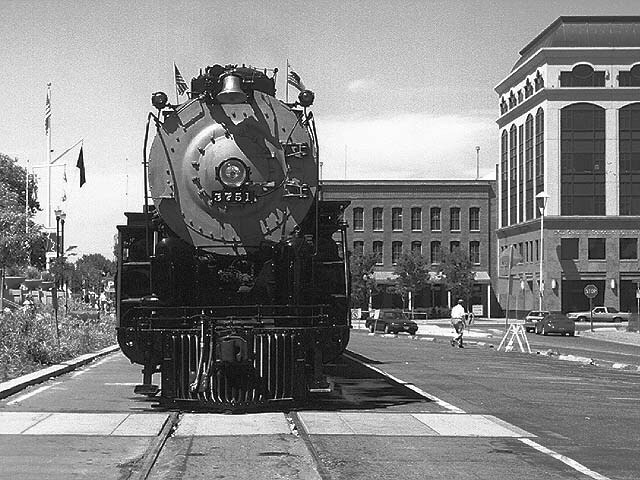 A stroll along the tracks near the Central Pacific passenger depot reveals a smorgasbord of small steam power. 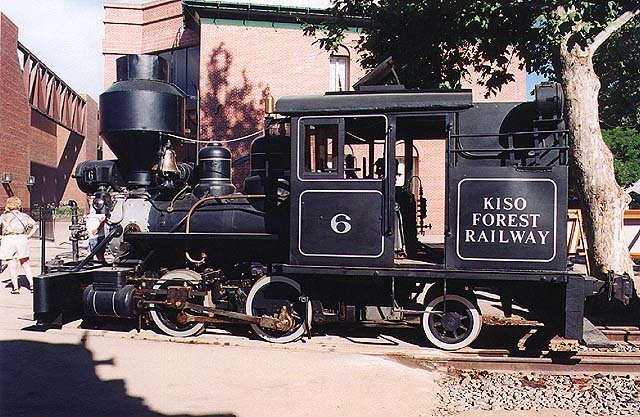 Here we have the Passumpsic Railroad's Heisler locomotive, constructed on 1922 for service in a stone quarry. It now makes its home in Vermont. Photo by Roni Gehlke. Kiso Forest Railway No. 6 hails from Central Honshu, Japan. This wood-burner is now owned by Henry Sorensen of McKinleyville, Calif. Photo by Roni Gehlke. Henry Sorensen must love his diminutive steamers. 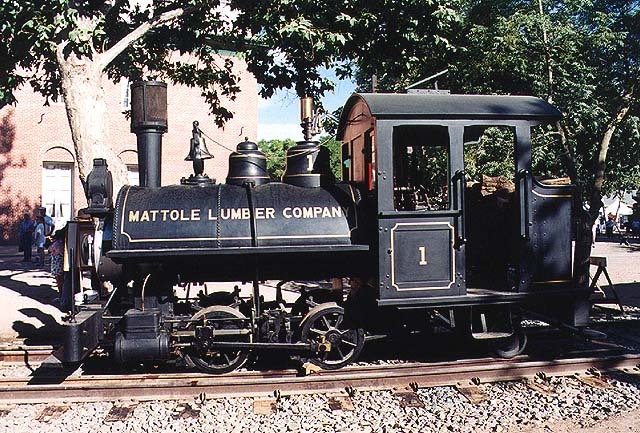 This one, the Mattole Lumber Co. No. 1, like the Kiso Forest Railway unit above, is also in Sorensen's possession. 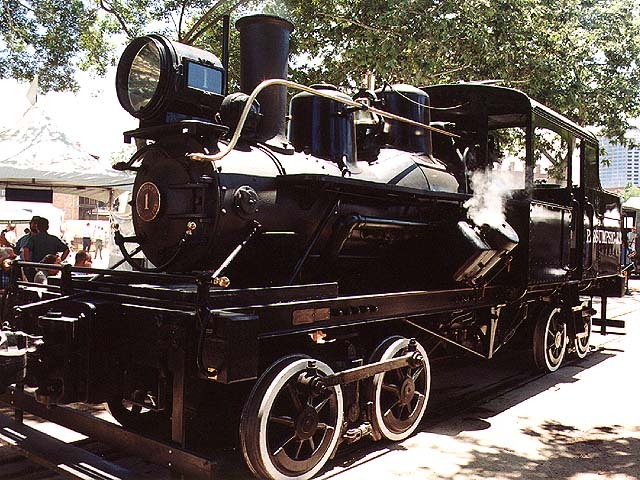 It was built in 1908 and hauled tanbark around northern California. Photo by Roni Gehlke. The Eureka is a real beauty. 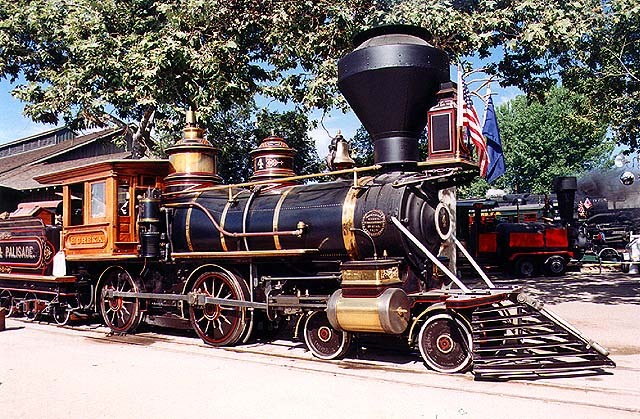 Built in 1875 for the Central Pacific Railroad, it once hauled silver ore and wood products in Nevada. It was painstakingly restored by Dan and Ditty Markoff of Las Vegas, Nev. It has appeared in several Hollywood movies. Photo by Roni Gehlke. 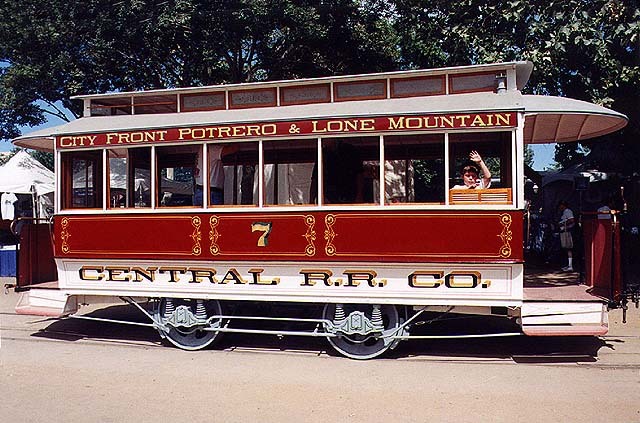 One of the few non-steam powered displays at Railfair '99, this horse-drawn streetcar was built in 1863 and operated in San Francisco -- a predecessor to the city's popular cable cars. The streetcar now resides in San Jose, Calif. Our son Benjamin checks out the interior. Photo by Roni Gehlke. 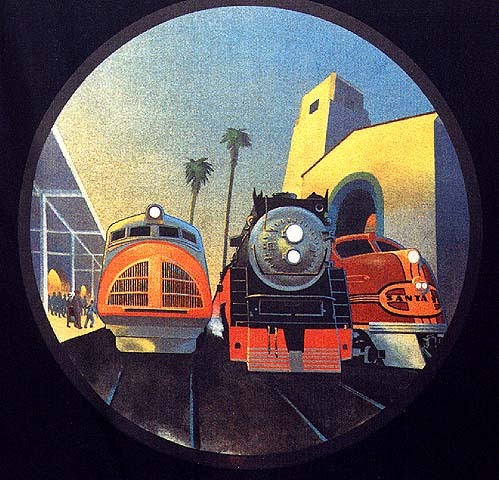 The face of the Southern Pacific 2467 was a welcome sight. Just days earlier members of the Pacific Locomotive Association finished restoring this 1924 4-6-2 steamer to operation and ran it from Oakland to Sacramento for its first public appearance. Photo by Roni Gehlke. We catch up yet again with Sierra Railway No. 28, which is taking a break from its tourist line duties at Railtown 1897 in Jamestown to partake in the festivities. 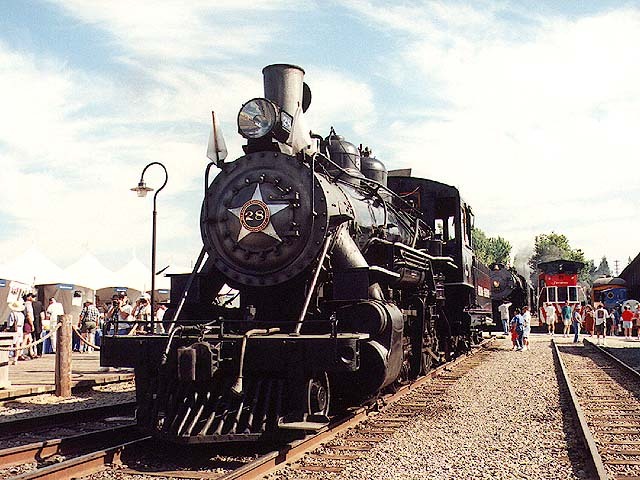 For more on this photogenic 2-8-0, take a look at the Railtown 1897 page. Photo by Roni Gehlke. Have you ever seen so much orange and black in one place outside of Halloween? This colorful trio of diesels includes, from left to right, Sacramento Northern SW1 switcher No. 402, Western Pacific GP20 No. 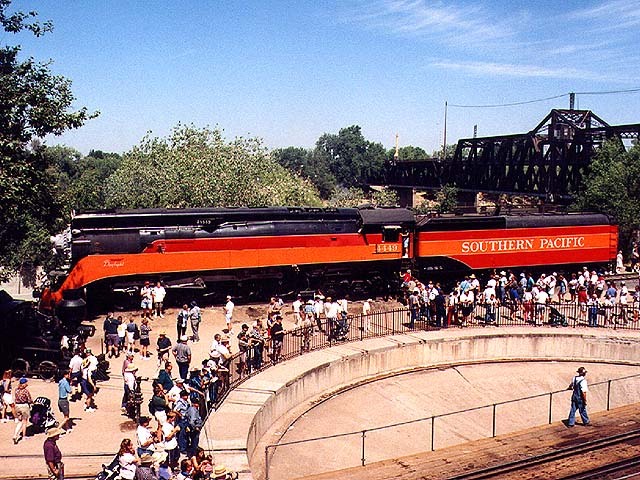 2001, and Southern Pacific GP9 No. 5623. Photo by Roni Gehlke. A closeup of some of the Railfair's artwork. This image lined the rear of the Gold Spike entertainment stage. A stage hand was kind enough to let us come up on stage for a better look. Photo by Roni Gehlke. Not all the action was outdoors, which was good given the high temperature. We managed to escape the heat briefly while enjoying the G-scale layout on display inside the Discovery Museum. Glenn and Benji are visible in the upper lefthand portion of the photo, watching the trains. Photo by Roni Gehlke. An old piece of signal equipment is on display near the Central Pacific depot. Photo by Roni Gehlke. 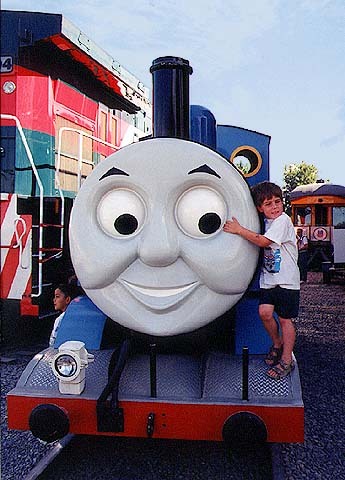 Thomas the Tank Engine was very popular with the children, as Benji demonstrates. It was difficult finding a moment to shoot a picture of the popular television character when it wasn't being mobbed by kids. Photo by Roni Gehlke. Operation Lifesaver staffed a large booth throughout the Railfair. 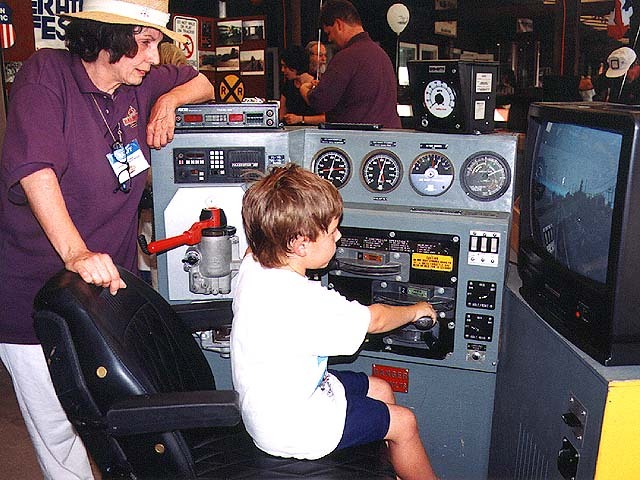 The booth included information about rail safety, coloring books, and the chance to pilot a locomotive in the popular simulation booth. Benji receives instruction from one of the volunteers. Photo by Roni Gehlke. We are suckers for a goofy photo opportunity. 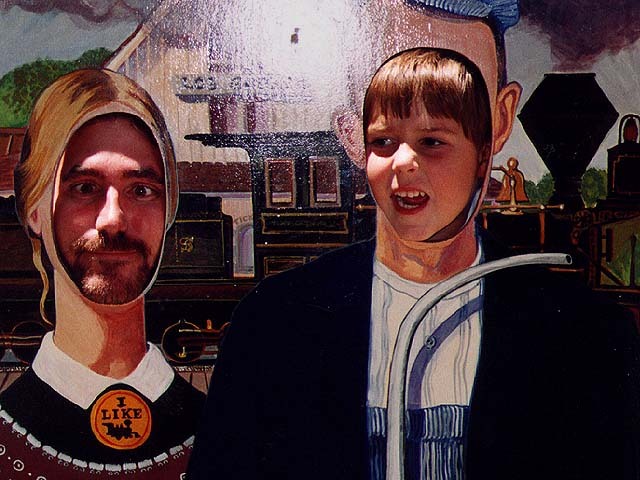 Benji and Glenn had a ball hamming it up for the camera in this rendition of American Gothic. The display was among the attractions in the "Train Yard for Kids" activity area. Photo by Roni Gehlke. So many pieces of rail equipment were on display that it was impossible to fit them all on the railfair grounds at once. 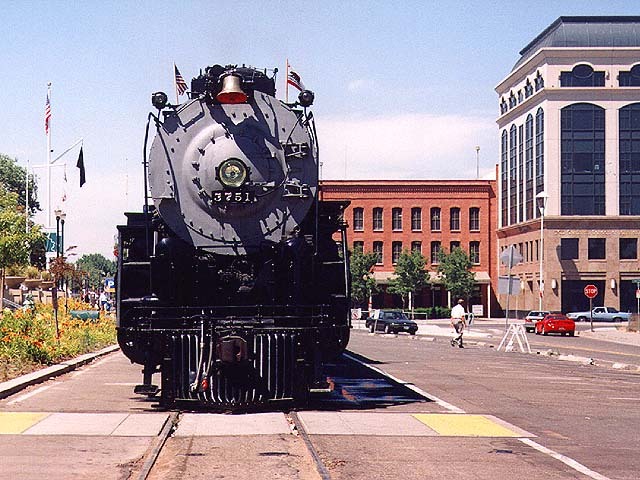 The Santa Fe 3751 found its way across J Street into the "Circle of Lights Depot" where the excursion trains were running. We shot it looking north toward the Old Town parking garage. Photo by Roni Gehlke. Same photo as #24, but we couldn't resist making a black and white version . If it weren't for the contemporary-style car in the right of the frame, you might be fooled into thinking this photo was taken decades ago. Photo by Roni Gehlke. 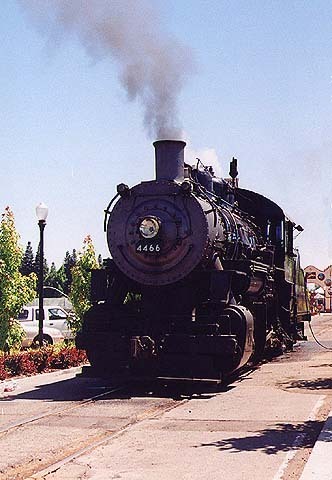 The UP 4466 takes on water in preparation to pull the next passenger excursion run along the Sacramento Southern rail line. The engine would be pulling our train. Photo by Roni Gehlke. 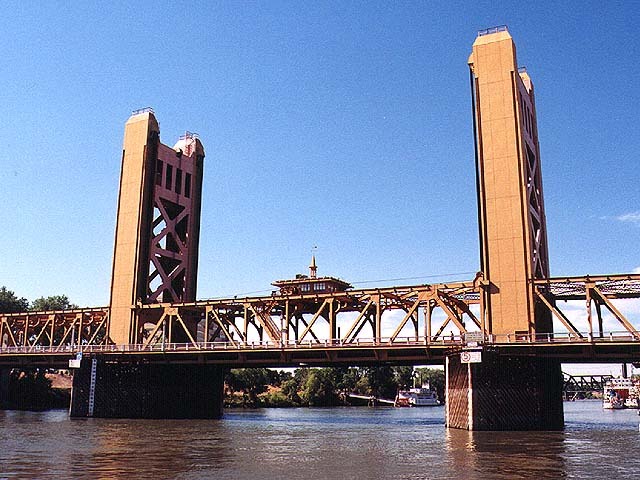 The Tower Bridge is one of the best known landmarks in Sacramento. We photographed it following our excursion ride. Photo by Roni Gehlke. 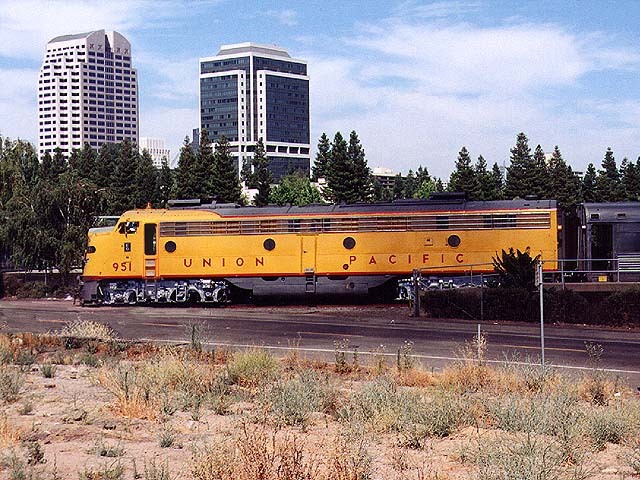 Another classic locomotive displayed off site was the Union Pacific 951. Moments after this shot was taken, the E9A moved closer to the action. Photo by Roni Gehlke. 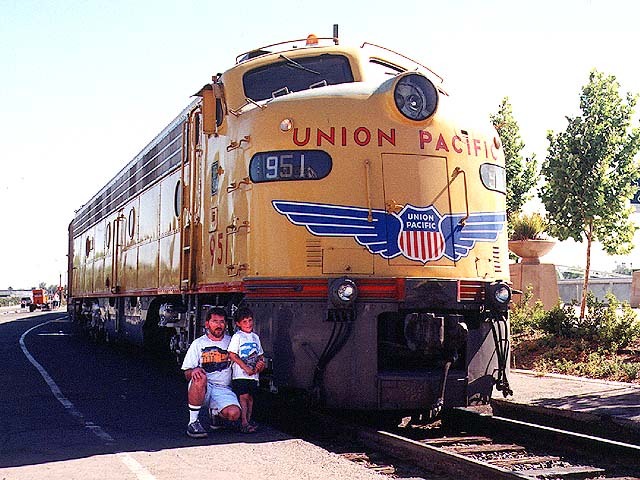 We conclude the day with a photo shoot in front of the UP 951. Photo by Roni Gehlke. This page was last updated Saturday, June 26, 1999 at 02:50 hrs.